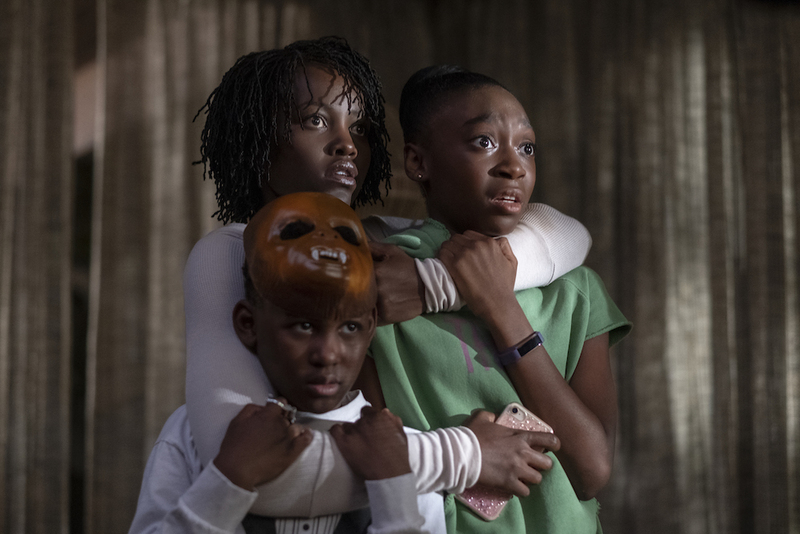 There’s a gut-wrenchingly tense moment at the end of the first act of Jordan Peele’s Us, inarguably 2019’s most anticipated horror movie, where the amiable and idyllic Wilson family are inexplicably confronted by what appear to be twisted, psychotic, murderous mirror versions of themselves during a terrifying home invasion. While tucked away at a summer beach house in the California Bay Area, isolated by miles of deserted driveway and overgrown woodland, the family are cornered into their living room by the intruders, who are clad in red jumpsuits and brandishing pairs of gold-plated shears, smiling menacingly down at their doppelgänger victims. Adelaide (played exquisitely by Lupita Nyong’o who, if there is any justice in this world, should have her second Oscar in sight) stares at her double, tears of fear and confusion in her eyes. “Who are you?” she asks, incredulously. “We’re Americans,” replies the double. From that point on, Us essentially becomes two films racing side-by-side. One film is a searing commentary on the dark underbelly of the American dream—how a country that was supposedly ideologically built on noble concepts like religious freedom, economic prosperity, and social equality could have strayed so far from its original intent, if that intent itself wasn’t a blatant lie from the very beginning. The second film is a popcorn horror movie, one that attempts to follow the tropes of a beloved genre, enjoyably gruesome and sickeningly thrilling. Only one of these films is successful, ultimately, and it makes Us a difficult film to critique, especially as a follow-up to Peele’s 2017 masterpiece Get Out, which set a new standard for the satirical thriller. Whereas Get Out expertly balances its message of extreme racial tension with its claustrophobic terror, Us sacrifices its integrity as a scary movie to make its point—and while that point is as compelling as anything Peele has produced thus far, it leaves a sense of directionlessness that’s hard to shake. Strangely, one of Us’ eeriest scenes (at least for someone that grew up in the United States in the 1980s) is its opening flashback shot, where a pre-pubescent Adelaide’s reflection is seen on an old school TV set, overlaid with a commercial for Hands Across America. Taking place on 25th May 1986, Hands Across America was a benefit event and publicity stunt where 6.5 million people joined hands across the contiguous US to raise awareness for poverty and homelessness. The cheery tone of the gleefully multi-ethnic ad contrast Adelaide’s sullen expression, and somehow what was seen at the time as the pinnacle of American values seems a little… off. Looking back, 30 years on, Hands Across America almost seems like an empty gesture, given the state of American politics in the era of Trump. That little seed of evil, the one that is currently wrecking so much havoc of our daily lives, can now easily be traced back to that falsely idyllic era of Spielberg, Michael Jackson, Valley girls, and yes, Hands Across America; because in actuality, Reaganism had a firm hold on American values in the mid-’80s, and its legacy of for-profit prisons, homophobia by the way of AIDS denial, funding of the inner-city crack epidemic, wealth inequality, and so many other social ills is still in full swing to this day, and undeniably gave birth to the nightmare hellscape of virulent Trumpism that is alive and well in America today. What happens when this sort of collective denial is let to fester, wilfully neglected and denied, for decades? What happens to a nation that seems pathologically incapable of reckoning with the sickness that seems to rot at its core? In Us, it takes the form of our deepest, darkest enemies: ourselves. The dissonance between what America thinks it is and what it’s actually become is too great, and the most disturbing, terrifying parts of our collective psyche are bubbling up from the sewers, ready to slice us into oblivion. This is the tale that Peele tells with Us, and it’s an effective one. It’s a story America needs to hear with its own ears, see with its own eyes, as told by one of its own. However, it suffers from one fatal flaw that unfortunately serves to undermine what could have been an otherwise concise and brilliant script. Peele has absolutely no idea how to tie all these elements together in a tight plot, and the cracks begin to show as soon as the story zooms out from that horrifying scene in the Wilson’s living room. Who created the doubles? We see that they live in an intricate underground society, but we never understand who put them there, or how they survive in mass numbers. They are seen as being humans, perhaps clones, not projections or hallucinations. Does everyone have a double? What about babies? Can you only be killed by your double, and what if you die of natural causes? Does your double survive alone? Is this phenomenon happening just in America, or the entire world? The doubles call themselves the Tethered, as their actions and desires are linked to their above-ground counterparts. But these psychic bonds seem to appear and disappear when it’s convenient for the story. And an obvious twist ending, which does nothing to advance the story and brings up much more questions than answers, is convoluted and trite instead of bone-chilling and exciting. Peele tries to explain these glaring oversights with a lengthy exposition scene between Adelaide and her Tethered towards the culmination of the film—but without offering any sort of real clarity, it only serves to bog down the ultimate confrontation between the two characters and end the film with a proverbial wet blanket. It’s painful to say, but watching the end of Us is like watching one of those videos of an extreme marathon runner’s body shutting down right before reaching the finish line—so close, and yet so, so far. 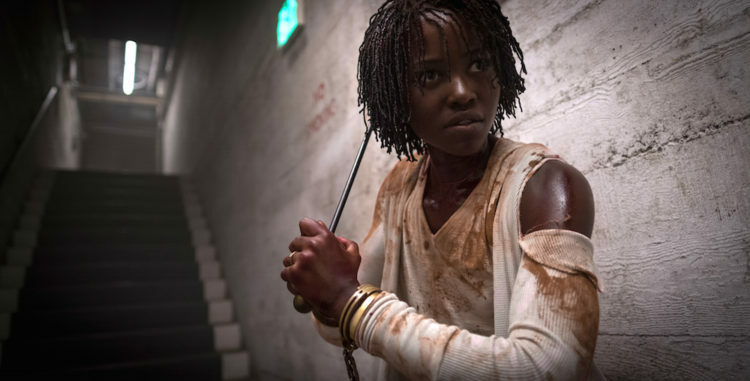 Despite these problems, Jordan Peele is still revealing himself to be one of America’s most important and prescient storytellers. Yes, Us misses the mark, but it contains truly transgressive ideas on the very fabric with which America is woven, instantly iconic scenes of true horror, and performances from its main cast that rival any thriller made in the past 10 years. Peele has been tapped to helm the reboot of the legendary sci-fi/horror anthology series The Twilight Zone, and hopefully this is where some of his more experimental ideas can dwell, while he continues to turn Hollywood on its head with his larger-than-life mix of humour, dread, and biting political commentary. Us is far from a total failure, and at the end of the day, much like the Tethered, exists only to bring our own greatest fears about ourselves into broad daylight.